Being able to float with enough balance is a pre-requisite. When we are shopping for a paddle board, we want to find one that can keep us afloat and stable as we enjoy ourselves out on the open water. It wouldn’t be too fun if we couldn’t get to where we want to go. Paddle boards should also track relatively well. That is, they can go straight relatively well when in motion. How Do I Figure Out What Size Paddle Board Is Right For Me? Before we dive into the different types of boards and their typical sizes, we want to look at four consideration that influence what size paddle board you might need. Image credit goes to blueplanetsurf.com for this awesome visual! 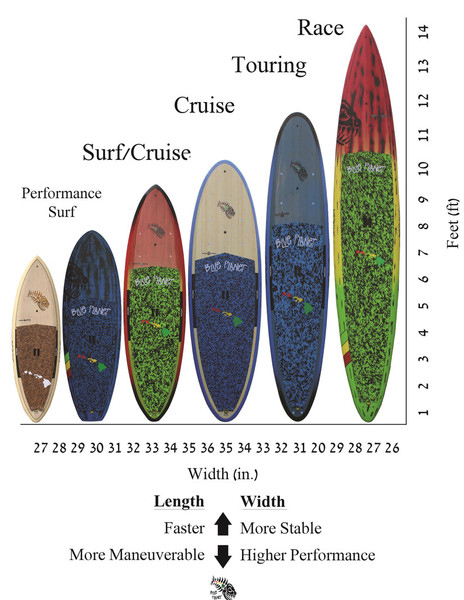 What Are the Most Popular SUP Boards? The most popular paddle boards are 10 to 12 feet in length, and roughly 30 to 34 inches wide. They seem to do well for most people of the average build, with decent stability for easy standing and paddling, and for general speed and tracking for gaining some distance. If you are looking for greater stability and balance, we want to find a board with a wider design. The width provides stability over the gentle waves and rocking as the board provides more surface area for greater water buoyancy. A width of anywhere between 30″ to 36″ can provide a decent amount of stability. You can pick and choose from any length, depending on what you might be looking for. Speed and maneuverability tend to be traded away for improved stability and balance. If you are looking for more speed and better maneuverability, we want a board that is long and narrow. A paddle board that has a relatively sharper nose can cut through resistance and glide across water much quicker than wider, shorter boards. A popular choice would be 12’6″ touring paddle boards or racing paddle boards. The boards may be anywhere between 28″ to 30″ wide. Even 26″ is possible, although seldom seen for recreational use. The narrow board also makes it easier to complete turns easier and quickly with less water resistance against the sides of the board. Keep in mind stability is traded away for greater speed and maneuverability in these types of boards. Did you know there are boards designed for yoga? They have a wider deck space for yoga postures and a hull that can provide greater stability. If there is a particular use you have in mind besides paddling around on the water, you want to find boards with specialized shapes and designs for specific uses. One popular use for paddle boards is for yoga. A board designed for yoga tend to be 10′ to 12′ and anywhere between 28″ to 35″ wide. The width provides a decent amount of surface to practice poses on while using a deck pad that provide your feet with a better grip. Another popular use is for fishing. A paddle board meant for fishing also has a deck pad for comfort and greater grip. The difference is that there is noticeably greater storage space to outfit your fishing boat to hold tackle boxes and other fishing gear as you spend more time out in the water. Paddling on a board is fun. They provide a lot of use cases, and come in different designs and sizes that can make being out on the water an enjoyable experience. It can be confusing to pick out the right size, with so many boards available on the market. In this guide, we look at what you can consider that may influence the type of board and its dimensions. We also look at why you might want one board size over another. We hope this guide helps you in deciding what paddle board size to shop for. Have fun on the water! Stay safe!